Uses a single AA battery (included). It is working properly. The readings are accurate. We'll make you happy if at all possible. make Supersized seem small. 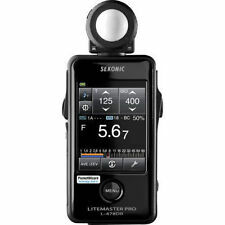 View meter by Sekonic. I don’t know anything about this. It was an estate sale find. What you see is what you get. Any questions, please ask. Flash, Cine. Min Storage Temperature. Max Storage Temperature. Release Date. Lux, footcandle, foot lambert. Illuminated Display. Light Sensor. Flash without synch cord (cumulative, non-cumulative), flash with synch cord (cumulative, non-cumulative), flash with radio triggering (cumulative, non-cumulative). It is in used pre owned condition. This is a Nikonos Underwater housing and a Sekonic Model 86 meter. It has a wrist/neck strap. the meter appears to be working properly but I do not have a instrument to test its accuracy. Buyer pays all shipping costs, Seller is not responsible for any shipping costs under any circumstances. 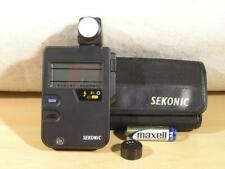 Sekonic Digiflash L-458. Condition: AB (Excellent ) Item no, 500068NK-EN. We appreciate your understanding. NO signs of usage. We appreciate your understanding. Compared with "AB", there is only a few scratch and/or removing the paint. These are pictures of the actual item. Condition:Excellent . tiny scuffs from normal use. It shows signs of use. ■ Appearance. Flash Light. We are willing to solve any problems. Receptor Head: Self Contained Sliding Lumisphere. We make it more long-lasting Receptor Reflected Light: Light receiving angle 33 Degree. We will work with you until you are satisfied. We are willing to solve any problems. We will work with you until you are satisfied. The actual appearance of the products may be a little bit different from the photos shown. We make it more long-lasting. Flash Light. We make it more long-lasting Display Range Shutter Speeds Ambient: 60 min to 1/8000 sec. Receptor Incident Light: Interchangeable Lumisphere and Lumidisc. Receptor Reflected Light: Interchangeable Lumigrid. Flash Light. We make it more long-lasting we make it unprecedented. Isn't it too easy?. We will work with you until you are satisfied. This is what it is. We need no repair fee under your warranty.